We are *so* here for this mega-inclusive Aerie moment. Cleo Wade, Aly Raisman, Samira Wiley and Molly Burke. Aerie, the underwear and sleepwear brand from American Eagle, just doubled down on inclusivity with the introduction of the new #AerieREAL Role Models. The brand has long been known for using unretouched photos and diverse models, but this new campaign features eight notable women, all of whom have been carefully selected by the brand to serve as ambassadors for body diversity. With the slogan "Your real power is YOU," the campaign focuses on featuring natural, unretouched photos of their real women models. 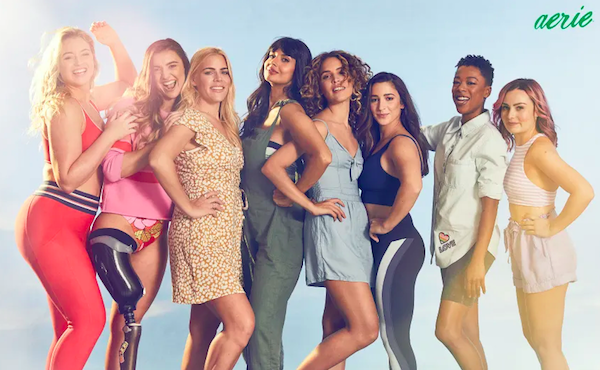 The campaign stars Olympian and sexual assault survivor Aly Raisman, model and body-pos activist Iskra Lawrence, Paralympic medalist Brenna Huckaby and actress/LGBTQ+ activist Samira Wiley, to name a few. Also amazing? This is the brand's first-ever inclusion of a blind woman: YouTuber and motivational speaker, Molly Burke. The reaction from Twitter users has been uber positive. Upon seeing the campaign, shoppers have remarked how "life-changing [this campaign] is for girls and women." One mom tweeted that her daughter "didn't have to ask [me] twice to take her to Aerie for a bathing suit." #AerieREAL has not only been transformative for customers, but for the models involved, too! Aly dished, "Being an #AerieREAL Role Model has been so empowering for me. I've seen the transformation within myself over the last year." The adorable collection behind the campaign offers a wide variety of items such as bralettes, tees, dresses, bathing suits, and more. Check it out here! What do you think, GL readers? Will you be checking out this ground-breaking collection from Aerie? Let us know in the comments below!